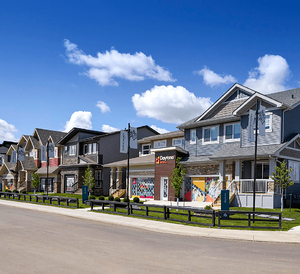 When you drive through the new west Edmonton community of The Uplands at Riverview, it's easy to see why so many people want to call it home. 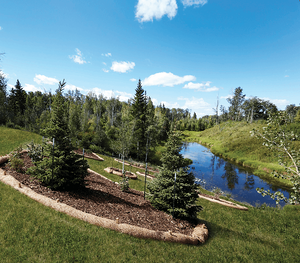 Nestled next to the river valley, you'll enjoy breathtaking views as you walk down the tree-lined ravines of Wedgewood Creek. It's a perfect balance between the escape of busy city life and all the modern conveniences you're used to. 1. Why did you choose the Uplands and how did you find it? Well, we were already living on the west side of the city and there was something special about the plan for this community. I heard about it from my work with a local home building company and am so glad I did! It's a great place to raise a family. 2. How does the community support your lifestyle? (Amenities, leisure activities, schools, commute, etc). It’s super close to the Henday but far enough away from the “busyness”. I commute to work and my wife works two minutes away so it was an easy fit for us. There’s a grocery store, gas station and more being built nearby. The community is fairly new, but more development is in the works and we're excited to see what comes next! The park has a playground which will be great for kids in the summer. The corner of 199th Street will have lots of amenities, as it’s all commercial. I am looking forward to the future of Uplands because will be really nice when all of the development is complete. We were planning for the future when we chose to build here because we can grow alongside the community. 3. Is there anything you would recommend about the community, a "must see"? The street lamps are a cool feature and make for beautiful evening strolls around the block. There are good walking paths throughout the community and a park for the kids to play at. Definitely take some time to explore the River Valley by taking a walk through the ravine. The University of Alberta Botanic Garden is also a short drive away and makes for a great date night or family field trip. Colton and his family are enjoying life in their brand-new home in The Uplands at Riverview and you can, too! Come down for a drive so you can fully experience the beauty and exciting future that's in store for this community. While you're here, you can also tour show homes and start planning out your ideal home in the heart of the river valley.